This post is sponsored by Jonathan Louis. Today I have a before and after furniture reveal that is pretty much mindblowing. A while back, I wrote about a quest for the perfect TV watching sofa. When we first moved into the house, I had purchased a vintage sofa with the thought process of it’s: used, it already has dents and dings, and I won’t be sad when my kids wreck it. That thought process lasted for exactly 4 months. After daily use, there were 3 new holes in the beautifully patinaed leather and my son had used his fingernail to scratch words into the back side of the leather. It was also sat through and incredibly uncomfortable with its shlumpy cushions. I had made a design disaster, and we needed a new sofa…badly. Confidence is building with the home office design project as I push through Week 3 of the One Room Challenge hosted by Calling It Home. In case you don’t remember, last week, I was styling the window sill behind the vintage Chesterfield from South Loop Loft and finishing the build on my new workspace. A last minute decision was made, throwing me off my game plan, and I chose not to use vintage indigo wedding panels and rattan I had found at a flea. My gut was telling me it was a bit trendy and overdone. Instead ordered up a beautiful mid-century modern velvet blush chair. I have my fingers, toes and eyes crossed that it arrives in the next couple weeks…or at least before this challenge wraps. Late last Spring I gave both my master and guest bedroom a major makeover. I was on design project overload, and oddly, it seemed like every other blogger on the planet was doing the same. What a strange coincidence. Everyone I knew was suddenly tearing their homes apart and documenting the process. Why are you guys stealing my thunder with your amazing room makeovers? Knock it off already. What the heck people? I kept seeing One Room Challenge here and One Room Challenge there. I’m sorry? What is this One Room Challenge you speak of? 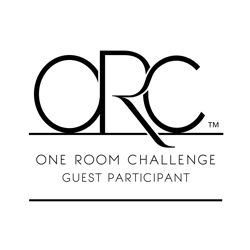 Finally, one night, I Googled One Room Challenge and was immediately taken to Calling It Home…an amazing blog on home interiors and low and behold, the creator of the one and only One Room Challenge. Twice a year, if they are up for it, bloggers are challenge to give an incredible room makeover to a disaster zone and given only 6 weeks to complete it. Motivating? Yes. Challenging? Yes. Insanely crazy? YES! How did I not know about this? Where was the blogger memo? How did I miss it, and more importantly, how can I join in because man-o-man does this look like one heck of a good time. Well, I had to wait until Fall to participate, but that time is now, and I’m here with bells on. Let’s do this already!